SAIPAN, NORTHERN MARIANA ISLANDS - Graciano Lisua doesn’t look like someone who would get too worked up about ghosts. 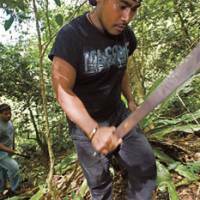 Yet superstition, says the broad-shouldered, barrel-chested Chomorron as he leans on his machete, is of great import for the inhabitants of the Mariana Islands. Traditionally, it seems, the aboriginal Chomorro people believe in taotaomona — spirits of the dead that are said to occupy, and even haunt, the mountains and jungles. “Offend them and you’ll be cursed with ill fortune,” he warns. Lisua’s timing is impeccable. 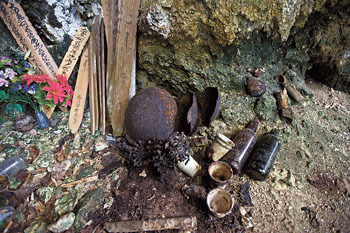 Before us is a dense tract of mountainous jungle where, 67 years ago, thousands of Japanese soldiers and civilians lost their lives during the Battle of Saipan that raged on the island from June 15 to July 9, 1944. What’s more, it’s said to be a popular hangout with taotaomona — and we’re about to trek into it. 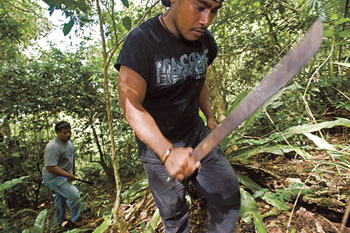 “Some people say they still see the spirit of a Japanese soldier who carried on living in this jungle for three or four years after the war ended,” Lisua says as he and Thom Chipwelong, another machete-wielding islander, slash a way through twisting branches and wiry ivy that has an uncanny penchant for human ankles. While the first man he refers to is quite likely mythical, the so-called Fox was very real. It was, in fact, the name given to Sakae Oba, a captain in the 18th Infantry Regiment of the Imperial Japanese Army, who gathered together and led 46 soldiers in this wilderness for some 16 months after U.S. forces officially declared Saipan secured from the enemy. Until February this year, few knew about the exploits of the former school teacher from Aichi Prefecture who, after repatriation to Japan, went on to serve somewhat less hazardous causes on the executive board of the Maruei Department Store and, later, on the local council of his hometown, Gamagori. That all changed with the release then of the film “Taiheiyo no Kiseki — Fokkusu to Yobareta Otoko” (“Miracle of the Pacific — the Man they called Fox.”), whose slightly more dramatic official English title of “Oba: The Last Samurai” follows that of a 1986 book by U.S. war veteran Don Jones, on which the film is based. The film attracted 332,000 people over its opening weekend, earning ¥390 million in box-office revenues and a No. 1 spot in Japan’s movie rankings. Filmed by two different directors and casts — one side Japanese, the other American — the film has already landed distribution deals in several European countries, including Britain and Germany. On Saipan, a special viewing of the film in late January played to a sell-out audience, garnering enthusiastic reviews and an announcement by the Mariana Tourism Authority that it alone would generate $22 million in publicity. This is welcome news for Saipan, which has been starved of publicity since the Asian economic crisis in 1997. Tour operators there reminisce about the pre-crisis “golden era,” when 12 flights per day would arrive from Japan alone. Today, there is just one daily flight from Tokyo’s Narita airport, with others from Osaka and Nagoya only operating during peak holiday seasons. The outcome is plain to see, with countless shops and other buildings on the island deserted. The once glitzy shopping and entertainment district of Garapan now also looks a bit neglected, and vandalism and theft have become social concerns. “The pace of life here has always been slow, but nowadays it sometimes feels to be slowing down even more,” says Hitoshi Yamaguchi, president of local dive-operator Mariana Sports Club Inc., which started its operations 38 years ago. “In Japan now, tour operators say the irregularity of flights means they can’t produce brochures for Saipan, so that’s not helping to keep us on the radar of potential tourists,” he says. 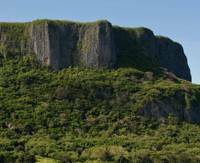 However, tourism officials on the island refuse to be pessimistic. Aside from a $6.2 million Japan Air Stabilization Program targeting year-round flights from Osaka and Nagoya that was signed into law last month, the Japan connection goes much deeper than the bubble years of the 1980s. Japan’s association with Saipan dates back almost a century, when it took over the island’s administration from Germany under a League of Nations mandate at the beginning of World War I and created thriving fishing and sugarcane industries. Apart from two distinctly Japanese-style wooden houses, which Marciano says are threatened with demolition, and the rusting steam locomotive used in the 1920s by Haruji “Sugar King” Matsue’s South Seas Development Co., little physical evidence of that early impact remains. So it is to the remnants of war and the tale of Capt. Oba that attentions have turned in hopes of producing the visitor fillip Saipan urgently needs. And indeed, a company Marciano has started, named Pacific Development Inc., offers tours of the island that take in renowned World War II sites, such as the infamous Suicide Cliffs where thousands of Japanese civilians leapt to their deaths in 1944 following an Imperial Edict promising them a privileged place in the afterlife. Additionally, a new tour Marciano has created that takes in yet more key sites from the Battle of Saipan — including the so-called Harakiri Gulch, where 60 Japanese soldiers blew themselves up in a cave to avoid capture — will, he hopes, attract growing numbers of Oba buffs from Japan and, should the film succeed elsewhere, from further afield. Eager to experience the first of Marciano’s “Oba tours,” I sign up there and then as the only one in my “group.” Consistent with the chronology of the film, we start in the Matanza district, site of the Battle of Saipan’s infamous June 7, 1944, Banzai Charge — or gyokusai (honorable suicide) as Japan’s wartime Cabinet Information Bureau called it. Oba took part in that suicidal attack by some 3,000 remaining combatants, but survived along with 47 other soldiers who he led into the jungles having convinced them that relief was on its way. In fact, upon his return to Japan, he adds, Oba was ceremonially stripped of his “posthumous” promotion to major — which had been awarded in the belief he had died during the charge. Though Oba didn’t know at the time he decided to carry on fighting, the relief that he’d promised his men was on its way would never arrive. Instead, Japanese cargo ships dispatched with a fleet of warships from the Philippines were intercepted by the U.S. 3rd and 7th fleets off the Philippines, resulting in their decimation in October 1944 in the Battle of Leyte Gulf — considered to be the greatest sea battle of World War II. When medical and other supplies ran out, he would undertake night raids on U.S. camps, at the same time smuggling out POWs to elicit information and cleverly replacing them with the same number of his own men. Russell also recalls attending a ceremony on the spot where, on Dec. 1, 1945, Oba surrendered to the U.S. forces — a after keeping up his resistance with his men for 512 days. Later on my tour, Marciano takes me to just that historic spot as well. Today, a narrow, dusty road runs through the site, which is located just below the stretch of forest that we later trek. 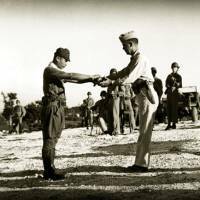 At about the point where Oba handed over his sword, there now stands the home of Jose Muno, whose father Tobias once helped hundreds of Japanese to recover the bones of soldiers and civilians who lost their lives in the jungles of Saipan. On the trek through the jungle with my machete-wielding guides, we find no such traces of this resourceful man’s stubborn resistance. 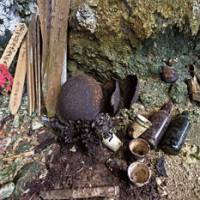 Many belongings, Lisua says, were probably buried or dumped in caves that were then demolished with explosives. We scramble to the top of a rocky outcrop and take in the view of the bay far below, the very same point where the 2nd and 4th divisions of the U.S. Marines landed at the start of the Battle of Saipan. Submerged out at sea, the tops of five Sherman tanks can just be made out in the glow of the late afternoon sun where once their transport vessel was sunk. It is enthralling to think of the way Oba, at age 32, ended his resistance — not in any cunning, foxlike way — but with his head held high, his 46 troops marching behind, and them all singing in unison a song commemorating their fallen comrades. 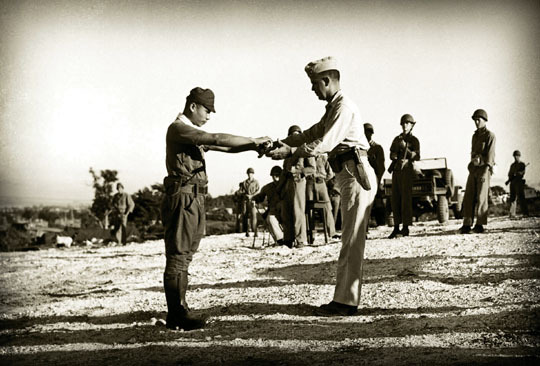 “Oba fought on his own terms, and surrendered on his own terms,” says Marciano, referring to Oba’s refusal to hand his sword over to the officiating Marine Corps officer, Lt. Col. Howard G. Kurgis, until ordered to do so by a senior Japanese officer the U.S. side had brought over especially from the mainland. For more on Pacific Development Inc.’s tours, visit www.pdisaipan.com.